The Birchwood Cafe in Minneapolis marks its 20th anniversary this year. The celebration menu includes a peek into the kitchen thanks to a new cookbook. Owner Tracy Singleton and chef Marshall Paulsen have collaborated to create "The Birchwood Cafe Cookbook: Good Real Food ," which includes some of the restaurant's most popular items. Singleton says customers inquire about the savory waffle more than any menu item. She and Paulsen included several recipe varieties — each with a distinct flavor — in the cookbook. 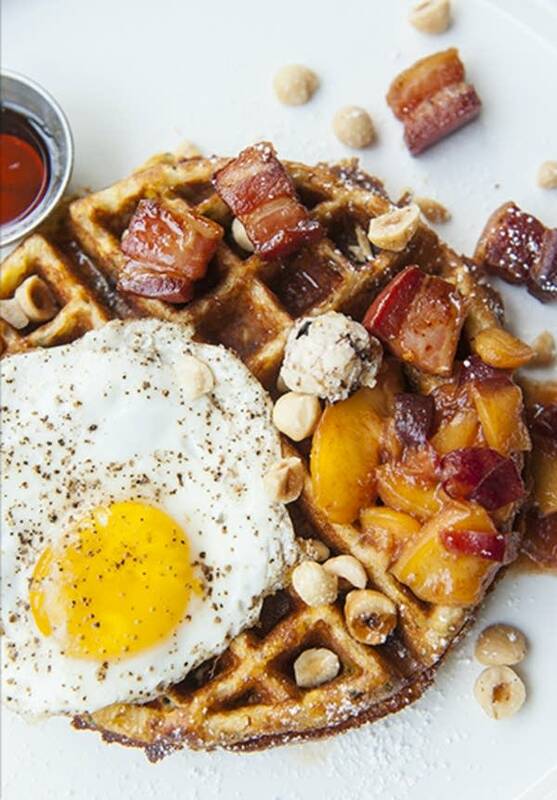 Recipes like the savory waffle are an invitation to cook like Birchwood does, while adding one's own family traditions and influences into the meal. "They're meant as just a starting point," Singleton said. But the restaurant is still keeping some secrets close to home. "Our key lime pie, people ask for that all the time and that is not in the cookbook," Singleton said. The cookbook is not just about the recipes. It contains information on the history of the cafe, as well as the regional farmers it partners with. Singleton says that her goal for Birchwood has always been to create relationships around food. She started the restaurant to "be a gathering spot where people can come connect with each other and connect with where their food is coming from." 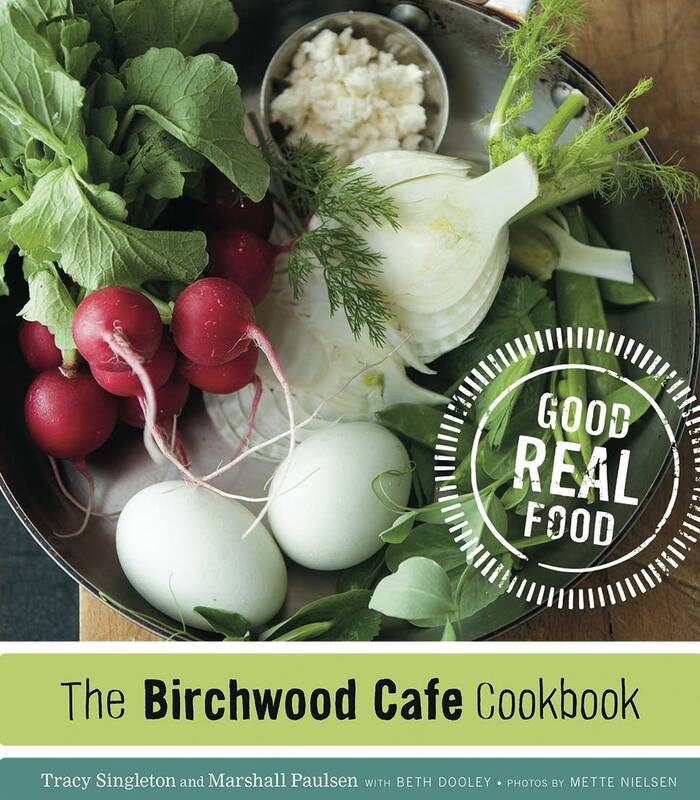 The cafe is throwing a cookbook launch party Thursday evening at Birchwood's Seward location. Come corn season, we work golden sweet kernels into every dish on the menu, starting with our stellar corn-studded savory waffles. We love to serve this waffle topped with a sunny-side up egg, crisp lardoons, toasted hazelnuts, and our fresh Stone Fruit Salsa. If that's too much, simply drizzle the waffle with maple syrup or top it with Sweet Corn Chipotle Coulis. Put the wheat berries in a pot with 2 inches of water. Bring the water to a boil, reduce the heat, and simmer until the grain is tender, about 50 to 60 minutes. Drain off the excess water, and set the grain aside. In a large bowl, stir together the flour, cornmeal, baking powder, baking soda and salt. Stir in the buttermilk, butter, and eggs to make a thick batter. Fold in the wheat berries, corn kernels, basil and thyme. Preheat the oven to 200 degrees. Heat up the waffle iron and lightly brush the cooking surfaces with oil. When the waffle iron is ready, pour in 1 cup of batter. Cook until the waffle is lightly browned, about 5 to 6 minutes. Transfer the waffle to a baking sheet and keep it warm, uncovered, in the oven until ready to serve. Repeat with the remaining batter. Serve each waffle topped with Stone Fruit Salsa. Ramp up the toppings by adding a sunny side-up egg, crisp bacon lardoons, and toasted hazelnuts, or keep it simple and just drizzle on some maple syrup. Kitchen note: Farro is also delicious in these waffles. Simply replace the wheat berries with ½ cup of cooked farro. Make this with any stone fruit available, including plums, pluots, nectarines and peaches. Be sure to taste the salsa before adding the honey as you don't want it to be too sweet. Bring a pot of water to a boil, and fill a bowl with ice water. Score a small "X" in the bottom of each peach. Put two or three peaches in the pot of boiling water just until the skins start to split, about 15 seconds. Using a slotted spoon, immediately transfer the peaches to the bowl of ice water. Repeat with the remaining peaches. Peel the peaches, then halve them, remove the pits, and chop the fruit into 1-inch chunks. In a medium bowl, stir together the peaches, onions, ginger, oil and lime juice. Taste the salsa, add honey as needed to sweeten, and season to taste with salt and pepper. Serve right away. This recipe for hand pies serves us through the seasons. The fun is deciding what to fill these with and what garnish will work best. The pies freeze nicely. The dough is simple to work with and also freezes well. Make an extra batch of dough to have on hand for future pies. 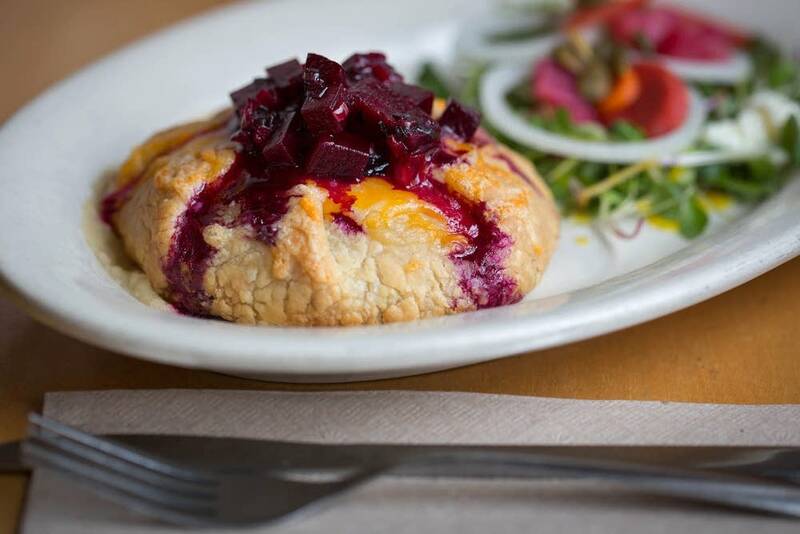 We garnish these hand pies with sweet and spicy beets for color and snap and serve them with parsnip puree and a small green salad. Preheat the oven to 350 degrees. Line a baking sheet with parchment paper, and put the pumpkin cut-side down on the parchment paper. Roast until very soft, about 1 hour. Allow the pumpkin to cool a little before scooping the flesh into a large bowl and mashing it. Measure out 1 cup of mashed pumpkin for the filling, and save the rest for another use. Toss the turnips with a little oil and salt, and spread them out on a baking sheet. Roast until the turnips are tender but firm, about 10 minutes. Toss the onions with a little oil, and roast until the onions are golden and very soft, about 20 minutes. Coarsely chop the roasted onions with a sharp knife. Stir the roasted turnips, onions, thyme, wine, maple syrup and cheese into the mashed pumpkin, and season with salt and pepper to taste. Allow the mixture to cool before stuffing the hand pies. Raise the oven temperature to 375 degrees, and line the baking sheet with fresh parchment paper. Divide the dough into 4 equal balls. Working on a lightly floured surface, use a lightly floured rolling pin to roll each ball of dough into an 8-inch circle. Mound 1/2 cup of the filling into the center of each one. Bring the edges of the dough together, and press to seal the edges. Bake until the crust is firm and nicely browned, about 20 to 25 minutes. This is one of the most forgiving pastry doughs. It comes together in a snap and is great for hand pies and pastries. Using a stand mixer with a paddle attachment or a hand mixer, whip together the butter, cream cheese and cream. Add the flour and salt, and stir just until the dough holds together into a ball. Turn the dough out onto a well-floured surface, flatten it into a disk, and wrap it in parchment paper. Refrigerate the dough for at least 30 minutes before using it. Recipes reprinted with permission from the University of Minnesota Press from "The Birchwood Cafe Cookbook: Good Real Food" by Tracy Singleton and Marshall Paulsen with Beth Dooley; photography by Mette Nielsen (2015). Text copyright 2015 by Birchwood Cafe, Inc. Photographs copyright 2015 by Mette Nielsen.